Piano/Keyboard Music from the Original Motion Picture Soundtrack. Composed by Adrian Molina, Germaine Franco, Kristen Anderson-Lopez, and Robert Lopez. Easy Piano Songbook. Softcover. 40 pages. 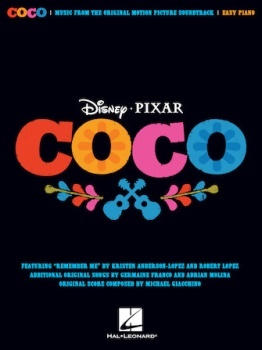 Here are 7 songs from the 2017 3D animated film from Disney/Pixar following the story of a boy named Miguel relating to a 100 year old mystery, including the signature song “Remember Me” by Kristen Anderson-Lopez & Robert Lopez; original songs “Everyone Knows Juanita,” “Proud Corazón,” “Un Poco Loco” and “The World Es Mi Familia” by Germaine Franco & Adrian Molina; and more.